Misogyny is defined as "hatred, dislike, mistrust of women, or prejudice against women." The world's oldest prejudice, misogyny has been institutionalized by governments and religions for millennia. In April of 2015, Kansas repeated this pattern by condemning second-trimester abortion patients in the state to substandard medical care. The safest and most common method of second-trimester abortion in the U.S., dilation and evacuation (D&E), will be illegal in the Sunflower State effective July 1, 2015, thanks to Senate Bill 95. The only exceptions are life endangerment and "substantial and irreversible physical impairment of a major bodily function." D&E became the standard of care across America in the 1970s based on published scientific evidence. Forty years later, the evidence supporting D&E as the preferred method is even stronger. Large case-series reports have shown low complication rates. A large cohort study from the Centers for Disease Control and Prevention showed that D&E was significantly safer than the alternatives of labor-induction abortion or hysterotomy (mini-cesarean). 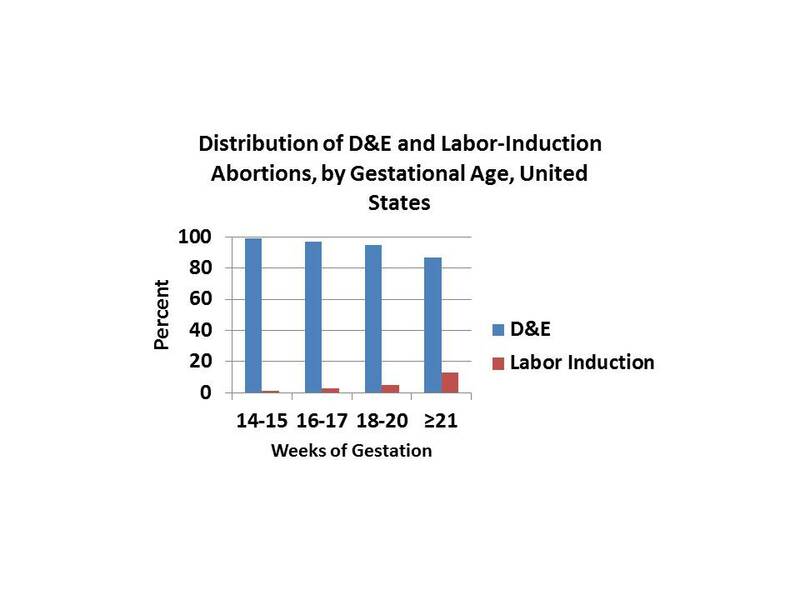 Other cohort studies have found D&E superior to labor-induction abortion for women with fetal deaths or with fetal anomalies. Randomized controlled trials, the most credible medical evidence, have consistently found D&E the superior choice. A recent major randomized trial in the U.K has once again confirmed this finding. Other non-medical considerations led to D&E supplanting older methods of second-trimester abortion. The cost of a D&E, usually an outpatient procedure, is generally less than an inpatient labor induction. Convenience is better as well. The D&E can be scheduled and plans made around the operation. In contrast, a labor-induction abortion has an indeterminate length. D&E abortion is more comfortable for women than the alternative. Local or general anesthesia is provided during the operation; despite analgesia administration, labor is painful. D&E abortion is more compassionate for women as well. Studies have shown that women fare better emotionally after D&E than after labor-induction abortion. D&E is the dominant abortion method used throughout the second-trimester in the U.S. (Figure). Because second-trimester abortions are much less common than earlier procedures, D&E accounts for about eight percent of abortions done in Kansas, similar to proportions nationwide. Sometimes physicians are sued for providing substandard care. Paradoxically, Kansas plans to prosecute physicians for meeting national standards of care in second-trimester abortion. Section 5 of the bill invites civil litigation against a physician by the patient, the putative father of the pregnancy, or the patient's parents if she is a minor. In Section 6, Kansas plans penalties as well: a first violation is a "class A person misdemeanor." Second and later violations constitute a "severity level 10, person felony." After signing Kansas SB 95 into law, Gov. Brownback tweeted to his fans, "Proud to sign SB95 protecting life at its most vulnerable stage with bipartisan support from #ksleg." Contrary to his assertion, the most vulnerable stage of pregnancy is the first few weeks, since most conceptions are spontaneously lost before seven weeks of pregnancy. Three ethical principles underlie all medical care: beneficence, autonomy, and justice. Beneficence means providing the best care possible for each patient. Autonomy means that patients are free to choose among all treatment options based on full informed consent. Justice implies equitable access to care. Kansas SB 95 violates all three ethical principles. It mandates inferior care, deprives women free choice among available methods, and forces women who want best care to cross state borders. Thus, physicians have an ethical obligation not to comply with this unjust law. SB 95 is an unwarranted and dangerous intrusion into the patient-physician relationship. The bill provides no medical or public health justification for outlawing the safest method of second-trimester abortion in the world today. Thus, one must conclude that the intent is to punish women by relegating them to obsolete care. Second-trimester abortions can still be done in Kansas, but by inferior methods. Commenting on misogyny, columnist Anna Quindlen once noted that, "The greatest public health threat for many American women is the men they live with." And for Kansas women, another threat is the government in Topeka.